Something odd is happening in the Enchanted Forest. 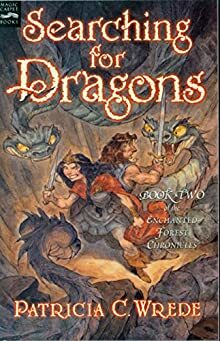 The magical lines are all messed up, and someone–or some dragon–has burned an entire section of the forest, and drained the magic out of it, allowing just anyone to wander in uninvited. When Mendanbar, King of the Enchanted Forest, goes to investigate, he visits the witch Morwen to find out about the dragon scales he found among the destroyed section of forest. Morwen discovers that the scales all came from the same dragon, but that dragon got turned into a toad a while ago. She sends Mendanbar to meet with Kazul, the King of the Dragons, to get the mess sorted out. Once he reaches there he meets Cimorene, Kazul’s head cook and librarian, who mistakes him for another suitor and tries to chase him off. Once the misunderstanding is sorted out she tells him that Kazul has gone missing while visiting her grandchildren. So Cimorene and Mendanbar head off to find Kazul. Searching for Dragons brings back all the fractured fairy tale antics of Dealing with Dragons, but adds in a quest that strengthens the plot. Between the two, I’d have to say that this book is better than its predecessor, if only because the plot is improved. On the other hand, the main antagonists (it’s the wizards again) are even more easily defeated than in the first book. I can’t help but think that in normal circumstances you’d be shooting yourself in the foot by making villains so easily defeated, but somehow it seems to work out just fine for the story. In a way, the wizards being so easily defeated reverses the character roles. Normally it’s the villains that are more powerful than the good guys, so the protagonists have to just be smarter to beat their enemy. In this case it’s the antagonists who are easily beaten, and have to come up with bigger and better plans each time around. Odd, but it does work. The strange thing about this book, is that the back cover blurb gives the impression that Cimorene is the main character. When really she isn’t, or at least she isn’t the viewpoint character. That honor goes to Mendanbar. In a way, he is the perfect match for Cimorene, as he easily fits in among the cast of regular people living in a fairy tale world. I highly recommend this book. Not only is The Enchanted Forest Chronicles a strong middlegrade series, but the book itself is very well crafted. I recommend reading them in order, but you can read Searching for Dragons as a standalone book.